Big bunches of berry smells jump right out from the 2012 vintage of the Layer Cake Cabernet Sauvignon–not bad for some on-the-go wine. Picked this bottle in part because of some decent history with Layer Cake (which I somehow cannot find right now, despite distinct memories of drinking it in our rental house) and in part because its screw top is conducive to easy access sans corkscrew. So what of the taste, say you? 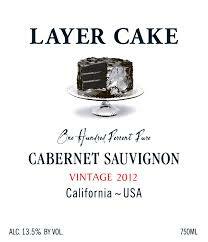 2012 Layer Cake Cabernet Sauvignon, California, USA. It’s juicy, it’s luscious, and there’s plenty of value here. Some of the depth (the chocolate?) that I recall from Carnivores past and other Cabs is in play here, as are some char-like flavors. No meal with this beverage; just some unwinding for a soul sorely in need of some. I’m glad I picked the 2012 Layer Cake Cabernet Sauvignon instead of their Malbec, which was close by but less of a draw on this occasion. Is it odd to say I liked the label? Its cake is not overdone but nevertheless memorable. I’m not talking about the font (which is sharp in and of itself) or the appearance of the label as much as I am its texture. The 2012 has a feel to it that’s almost embossed; some cool ink work that I admire from a production standpoint. The 2012 Layer Cake Cabernet Sauvignon hails from a California vineyard that has a clever back story. The grapes come from the Alexander Valley, and there is good reading all over the web on the particular minerals and terroir of this AVA. You should take a moment and Google the region–maybe even while enjoying a glass of this fruity red. This entry was posted in Cabernet Sauvignon and tagged $15-$20, alexander valley, California, california winemaking, USA.